Choose your bottle bag colour black, red or natural. The bottle bag is made from sturdy 100% cotton and has pull-string ties at the top. Choose your bottle bag colour black, red or natural. The bottle bag is made from sturdy 100% cotton and has pull-string ties at the top. 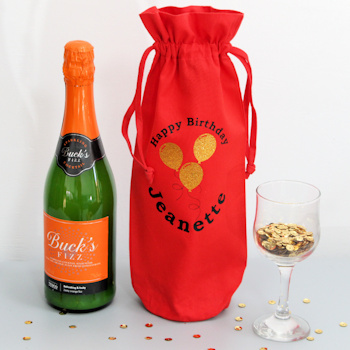 The bag measures 17cm(W) x 37cm(H) so it can fit most wine, beer or champagne bottles. Makes a lovely keepsake gift for many special occasions. Enter the text you want sewn. We will arrange the text in a layout that looks best.